The Jets hope to sign Williams to a long-term extension this offseason, Manish Mehta of the NY Daily News reports. Williams finished the 2018 season with 42 tackles (27 solo) and five sacks. Analysis: Williams is the guy opposing offenses scheme against on the Jets' defensive line, so he often battles double teams. While his presence helps open up space for teammates, Williams has underwhelmed in terms of personal statistics since getting selected sixth overall in the 2015 draft. Williams had two tackles and a sack before being ejected for allegedly throwing a punch in Sunday's overtime loss to the Packers. Analysis: Williams was tossed late in the second quarter as he tangled with right tackle Bryan Bulaga and allegedly threw a punch during the scuffle. The 24-year-old was able to record a sack in the first quarter, his fourth of the season and first since Week 5. Williams (back) won't carry an injury designation into Sunday's game against the Colts. Analysis: Williams was sidelined at practice Thursday but was able to return in full Friday to avoid the questionable tag, Manish Mehta of the New York Daily News reports. The 24-year-old will have his usual starting role on the defensive line for the Jets on Sunday. 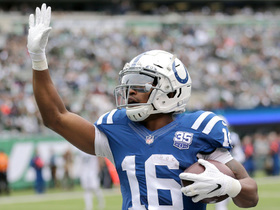 Williams did not participate in Thursday's practice due to a back injury, Eric Allen of the Jets' official site reports. Analysis: It appears that there is still plenty of unknown surrounding Williams' health, as head coach Todd Bowles suggested that the defensive end is still undergoing testing. Popping up on the injury report this late in the week is never a good sign, and Leonard will likely have to at least put in limited work Friday in order to have any chance of playing Sunday against the Colts. Williams recorded five tackles (two solo), including two sacks, in Sunday's win over Denver. Analysis: Williams now has three sacks over the past two weeks after failing to notch one in the team's first three games. He's already bested his total from last season and is on pace for the highest single-season sack output of his career. 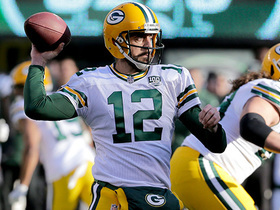 He'll aim to continue his success and take down Andrew Luck as the Jets face off against the Colts next Sunday. 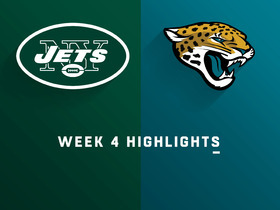 Williams posted five tackles (four solo), including a sack, in Sunday's game against the Jaguars. Analysis: Williams' sack Sunday was his first of the season. He hasn't had prolific numbers despite being a quality player throughout his career. He'll aim to stack success when the Jets take on the Broncos in Week 5. The Jets are expected to pick up Williams' fifth-year team option, Manish Mehta of the New York Daily News reports. Williams finished the 2017 season with 47 tackles and two sacks. 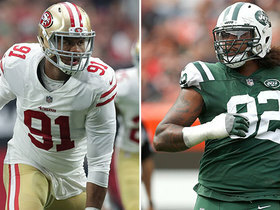 Analysis: The drop in sacks from seven to two was certainly a concern for the Jets, but Williams is still easily the best defensive lineman on the team. He is likely to be asked to do even more in 2018, as the team is expected to move on from Muhammad Wilkerson, who has been incredibly poor the past two years. If that's the case, it's possible the Jets move Williams outside more, which could help his sack total move back up. Williams (back) won't carry an injury designation into Sunday's game against the Patriots. Analysis: Williams' only practice of the week was a full session Friday, but apparently it was enough to avoid the questionable tag. The 23-year-old will aim to finish a quiet season on a high note against the Patriots on Sunday. Williams (back) sat out of Wednesday's practice, Connor Hughes of NJ.com reports. Analysis: Williams has missed parts of his last two contests with a concussion and now a back injury. The third-year pro has still been able to produce modest numbers, with 45 tackles (21 solo) and two sacks through 15 games. However, he'll likely need some sort of practice participation to avoid missing his first game since entering the league. Williams suffered a back injury during Sunday's game against the Chargers, Connor Hughes of NJ.com reports. Analysis: The severity of Williams' injury is not yet known. The timing of the injury is a little rough given Williams recently was able to overcome a concussion that had been plaguing his availability. With Williams out, the Jets relied heavily on Kony Ealy. Williams cleared concussion protocol and will play Sunday against the Chargers. Analysis: Williams suffered this injury in Week 15's game against the Saints, and he's progressed enough in the league's protocol since. The third-year pro has 45 tackles (21 solo) and two sacks this season, so it's still tough to see him as a top IDP threat. Williams (concussion) was a limited practice participant Wednesday and remains in the concussion protocol, Eric Allen of the Jets' official site reports. Analysis: Williams sustained the concussion in Sunday's loss to the Saints, and his limited participation Wednesday indicates he has made some progress, at least. Even if the 23-year-old is able to clear the protocol before Sunday's game against the Chargers, it's not guaranteed he'll actually be able to play. Head coach Todd Bowls said Williams sustained a concussion Sunday against the Saints and has entered the league's concussion protocol. Analysis: Williams will thus need to be cleared by an independent neurologist in order to play in Week 16 against the Chargers on Sunday. His availability in practice this week should help clarify his chances of suiting up. Williams is questionable to return to Sunday's game against the Saints with a head injury. Analysis: Williams headed to the locker room to be evaluated for a head injury, which could end up being a concussion. The 23-year-old seems unlikely to return, as the game is currently in the final minutes of the fourth quarter. Williams posted two tackles (one solo) against the Broncos on Sunday. Analysis: Williams now has just four tackles (one solo) and a half sack over the last three games. The third-year pro played 59 of 70 defensive snaps, so it's not for a lack of opportunities. In the midst of playoffs, Williams isn't a reliable enough IDP asset to bolster championship rosters. Williams recorded two tackles and 0.5 sacks in Sunday's win over the Chiefs. Analysis: Williams now has two sacks in his past four games, after starting the first eight games of the season without one. He'll look to continue to get after the quarterback this Sunday when the Jets head to Denver. Williams recorded a sack in Sunday's loss to the Buccaneers. Analysis: Williams, who went the first eight weeks of the season without a sack, has now recorded a half-sack and a full one in consecutive weeks. On the day, the 23-year-old notched four tackles (three solo) across 50 defensive snaps (70.0 percent). 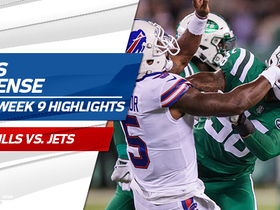 Williams had five tackles (three solo) and a half-sack in Thursday's win over the Bills. Analysis: The half-sack is Williams first of the season. The 23-year-old had a quiet first nine games with 32 tackles (18 solo), and is on career-low pace in for both sacks and tackles. 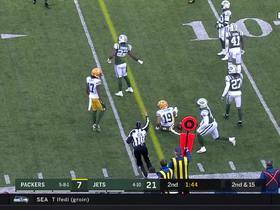 Green Bay Packers quarterback Aaron Rodgers finds wide receiver Equanimeous St. Brown for a 34-yard gain. 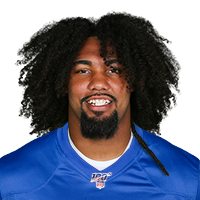 New York Jets defensive lineman Leonard Williams gets ejected for scuffle with Green Bay Packers tackle Bryan Bulaga. 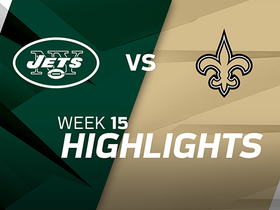 Watch as the New York Jets take on the New Orleans Saints in Week 15. 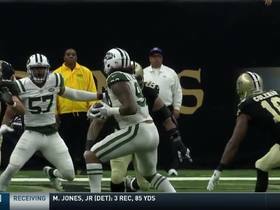 New York Jets defensive end Leonard Williams picks off a pass from New Orleans Saints quarterback Drew Brees. 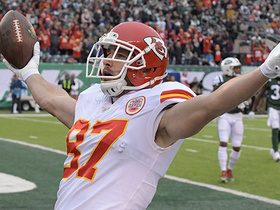 Kansas City Chiefs tight end Travis Kelce and quarterback Alex Smith connect for their second touchdown against the New York Jets in Week 13. The New York Jets defense was dominant against the Buffalo Bills as they not only shut down the elusive LeSean McCoy, but racked up seven sacks and forced three turnovers in a huge victory. 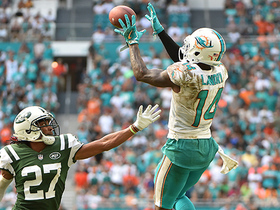 Miami Dolphins QB Matt Moore hits wide receiver Jarvis Landry for a 29-yard gain.